Utah Business - A new machine/robot called the Data Matrix Scanner is going to automate a lab’s procedures to test for cholesterol particles at high volume and without the messy turns and pitches of human error. This is no ordinary solution—it is a story of solving technological challenges in modern laboratory medicine for an important test. 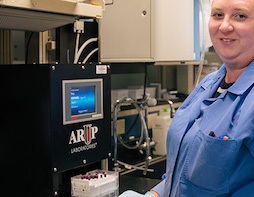 ARUP Laboratories needed a unique fix to move that test in-house, photograph in one shot 96 test tubes on a tray with their accompanying tiny barcodes, and process 3,000 test tubes a month while tracking the number and ID for each. So lab supervisors and in-house engineers worked out their needs and had it built.